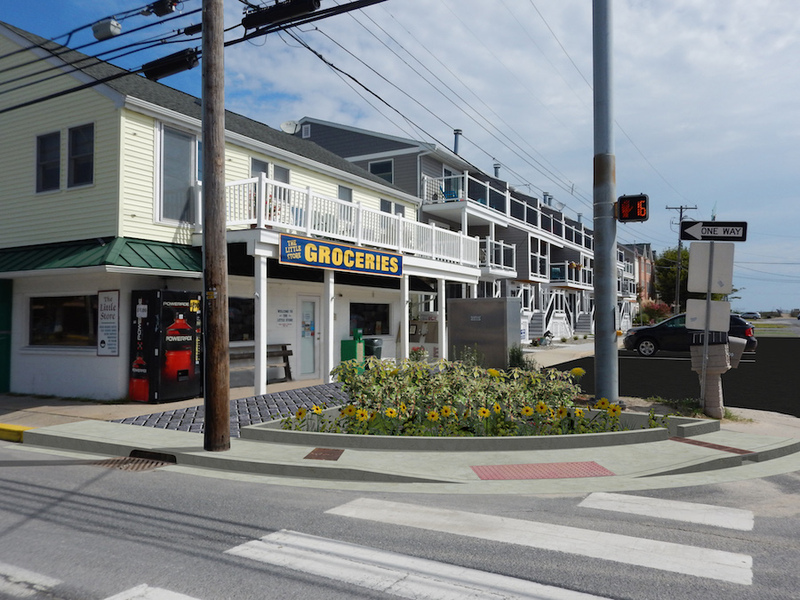 Dewey Beach, DE – This coming fall, new green infrastructure project by the Delaware Center for the Inland Bays and the Town of Dewey Beach will soon reduce nuisance flooding and treat polluted stormwater at the northeast corner of Coastal Highway (SR1) and Read Avenue, just outside of the Little Store grocery. Intense development, a low-lying geography, and sea level rise have made management of stormwater an increasing challenge in Dewey Beach. For this reason, a stormwater treatment project is in the works that will consist of a planted bioretention facility (also known as a stormwater treatment area) and a trench to allow runoff to seep into the ground. This reservoir will be covered by permeable pavers, creating porous pavement that allows water to seep into and be filtered by the soil beneath. A charcoal-like material, called biochar, will be added to the soil to improve pollution removal from the runoff. The biochar will also enhance the growth of the attractive and functional vegetation planted in the bioretention facility. Once completed, this new green infrastructure will achieve improved drainage and treatment for a 2.7-acre drainage area, reduce the percentage of impervious surface in the Town, and reduce flooding on Read Avenue. Through the reduction in, and the soil filtration of stormwater, we will also see improvements in the health of Rehoboth Bay. By controlling nonpoint source nutrient and sediment pollution to the Bay, these retrofits contribute to implementing the Inland Bays Comprehensive Conservation Plan. It will also serve as an important demonstration to both residents and officials of Dewey Beach and other Inland Bays coastal communities of how innovative green infrastructure tactics can improve both flooding issues and water quality, and at the same time enhance the streetscape and be an asset to local businesses and other properties. This project will be engineered by RK&K and will be funded by a Community Water Quality Improvement Grant and funding match from the Town of Dewey Beach. Grant funding comes from the Delaware Department of Natural Resources and Environmental Control’s (DNREC)’s Water Infrastructure Advisory Council.